The Texas Politics Project in conjunction with the Department of Government at UT-Austin is proud to offer GOV312L: Politics and Government in Contemporary Texas, presented by Dr. James Henson, Director of the Texas Politics Project. 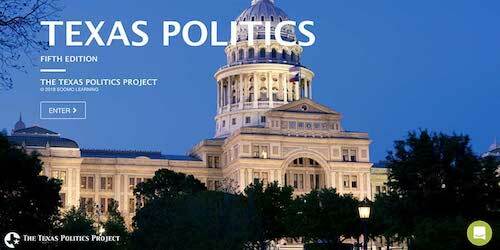 The Texas Politics Project provides numerous resources to university or high school instructors, including our online Webtext, public opinion data on a range of policies and topics, and a robust archive of interviews with numerous political actors from the state's political history. 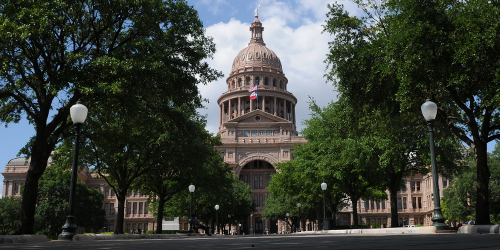 In addition, please visit our educational resources page for graphics, articles, and interviews targeted for specific topics in a course on the Texas Constitution and Texas Politics. Students interested in learning about Texas Politics can find plenty of information in our online Webtext, through our public opinion polling, and through our primary source video archive. In addition, please see our resource list on the right hand side of this page for a number of useful websites about Texas and Texas politics.